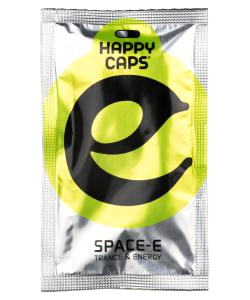 Happy Caps - Space -E Space-E is now in a new and improved formula! It contains a unique blend of powerful ingredients to fuel your party needs. Trance and Energy. Take 1 or 2 capsules 45 minutes before the deired effect. Take with water. Do not use alcohol.Do not exceed the maximum dosage of 2 capsules per 24 hours.